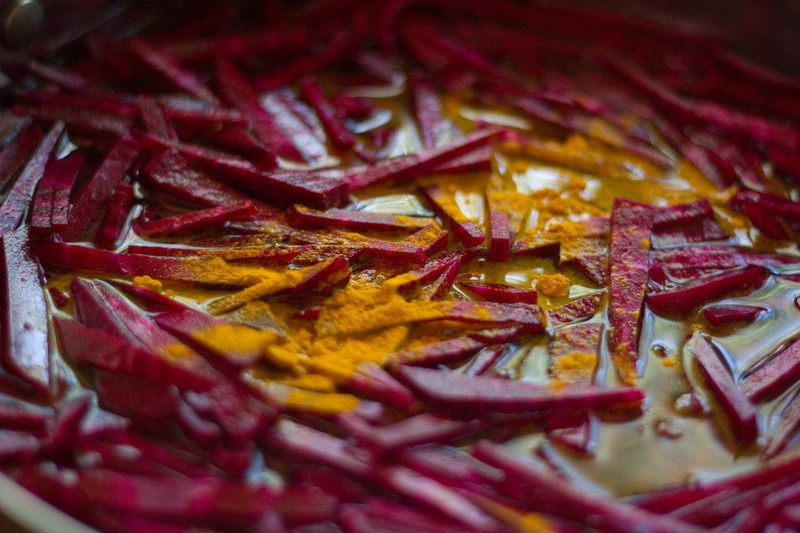 The Colors Of Indian Cooking: I Got Yer Beets! Right Here! I Got Yer Beets! Right Here! I love this picture. It reminds me of a WWII poster.."Beat the Nazis With Beets! Grow A Victory Garden Today!" It's also very old skool Soviet Union. "Eat More Borscht Comrades!" How did it come about? I was fixing this beet dish and I shoved the bowl at Alan while standing under the kitchen skylight. He took the picture. I had been looking for a cooling easy summer salad to go with a spicy goat vindaloo lunch I was planning. I cruised the vegetable stands of our local Farmer's Market looking for something to catch my eye. It had to be tasty, colorful and cooling to go up against all the chilies I'd be using, and above all, easy. I needed a dish that could be made ahead of time (like the day before) that would still taste fresh the day I was serving it. I looked at okra. Okra was dicey (hhmm diced okra?) considering I've only successfully managed to get it into Alan once. Scratch the okra. Pea shoots are always good but I do those too often. Gotta keep the mystery happening. Cold spinach with peanut powder and coconut, also too familiar around here. Then I saw the beets. 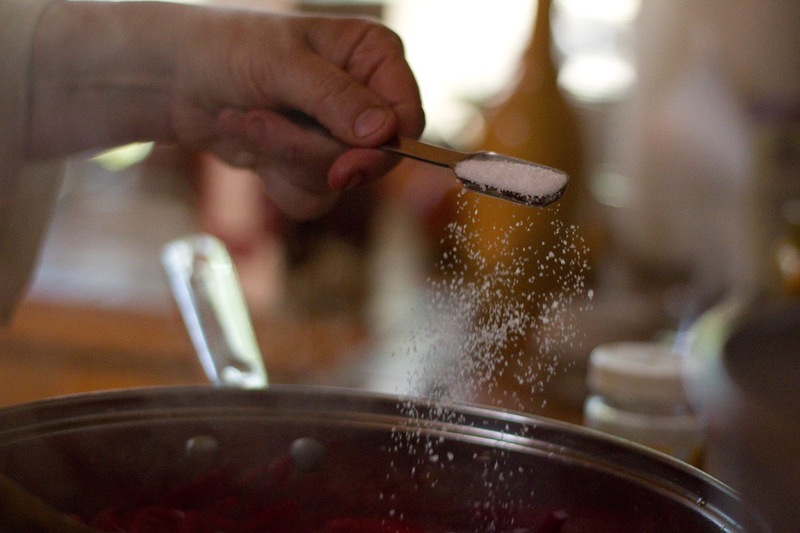 Beets, the dish that you can use twice. First cook the beets, then cook the greens. I figured that I could save the greens and just use the beet part for my purposes. I'd make a cooling salad of finely chopped glazed beets and mustard seed which is exactly what I did. Let me state at the beginning that one good reason to make this salad ahead of time, besides taking some of the work load off the main event day, is to be able to serve food without looking like a serial killer, or an extra off Dexter. Beets do bleed...nothing you can do about that. At least it's a bit of a break to give it a day to rub off. Wash and dry 1 and 1/2 lbs of beets. Put the beets into a large skillet or kadhai. Bring it all to a boil and cook that way for about 7 to 10 minutes, or until the beets are cooked through but still firm. 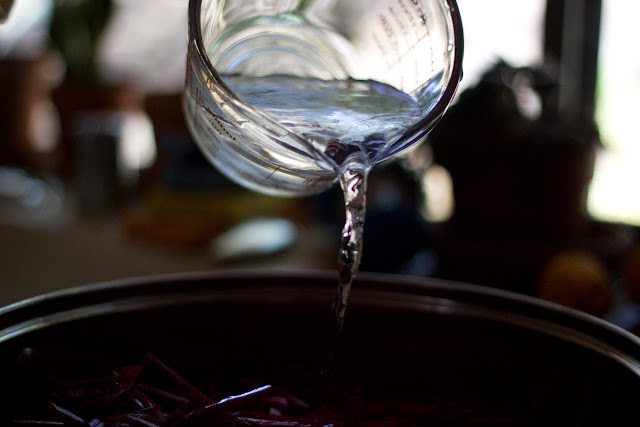 Drain the beets and set them aside. Heat 2 Tbs of vegetable oil in a skillet or kadhai. When the mustard seeds start popping, add in the beets and cook them for about a minute or until they're nice and coated with the oil and mustard seeds. Stir them around for another minute, then take them off the fire. You are done. Check them for seasoning and serve them up. 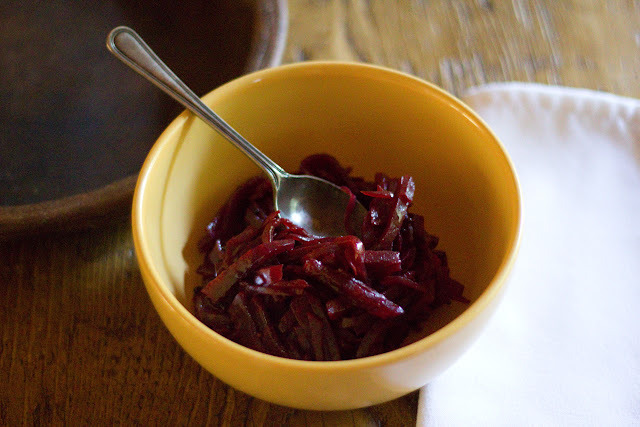 These beets can be served warm, at room temperature or chilled. Who doesn't like something this versatile? They'll keep in the fridge covered for a couple of days, but chances are they'll be long gone before that. These are so fast to make and so tasty that they'll easily fit into the barbeque season menu. Perfect for potlucks, they're a natural for picnics and all the rest of this Summers' activities. I'm pretty excited to be participating in Goaterie next month. Click on the word and read all about it. In a nutshell, it's a Goatapalooza writ large! All goat all the time. As you can see, I proudly display the Billy Badge on my website. I'm joining this goat roping and can't wait to see all the goaty delights ( goat meat, goat cheese, goat milk) being whipped up by others during the month of July. Loved the first snapshot; it does remind one of the old-70s-style cookbook pictures. It's a Goatapalooza here everyday in Nepal. Go up a little higher & it's a Yakapalooza! I looooove that picture! I also love beets. 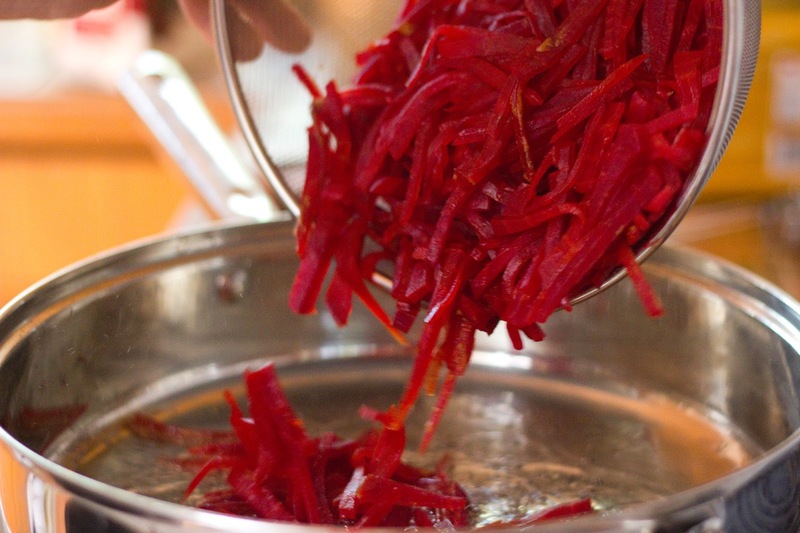 I like the idea of Indian borscht. I hate beets, except in juices. My mom exhorts me to drink a glass of beet juice daily, she said it will make me pink like a beet. LOL! 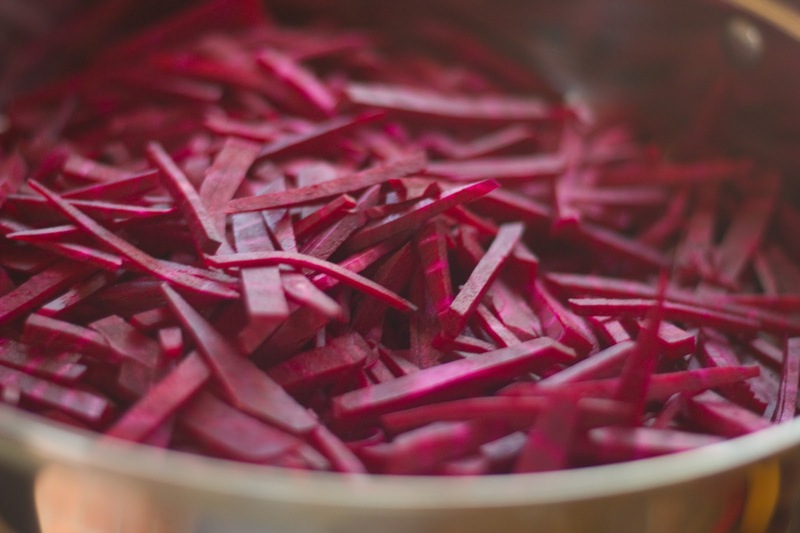 I love beets and this recipe looks delicious. Will definitely give it a try.